Available soon, for sale or rent: brand new island with sea views from the terrace, fresh fish daily and swimming pool in the resort hotel. An ideal base for 225 pioneers with £100m-plus to spare and a yearning for a new political and social system. For the right-wing American libertarian with deepseated problems with government , the 19th century challenge to "Go West, young man" retains a powerful appeal. But for the current target audience — the free-wheeling capitalist dotcom millionaire in Silicon Valley — going west means getting wet. According to a new design report, "Seasteads" will be communities of like-minded , self-governing individuals established on the high seas, free from what its proponents see as the restrictions of nations , welfare systems and punitive taxes. 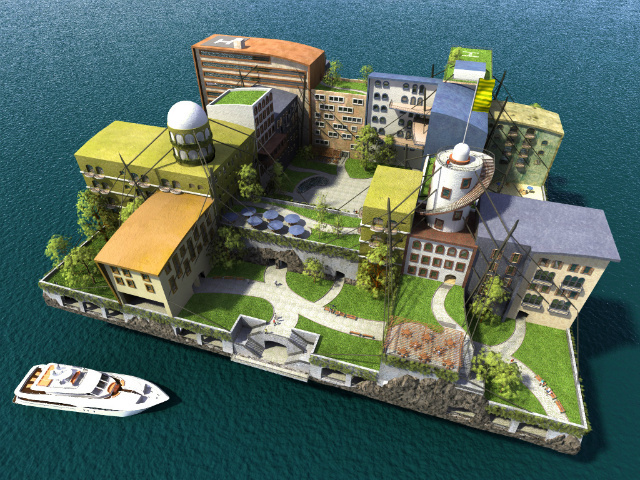 The seasteading movement has emerged as a political movement to create new water-borne city states. Over 85 pages, a Dutch engineering and urban development company has outlined the feasibility of a floating "village" for 225 permanent residents and 50 hotel guests. 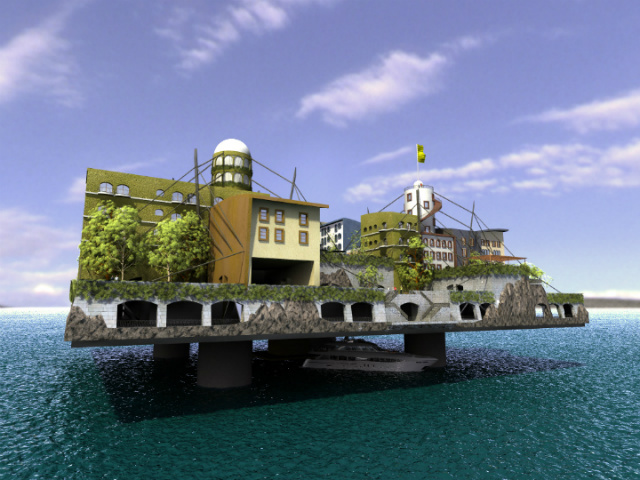 The design consultants envisage a series of interlocking "hollow box" square and pentagonal platforms, allowing each city to grow organically — or be dismantled and towed away in the event of political dispute or interference. Individual seasteaders would decide on how they would rule or be ruled. According to the feasibility study by DeltaSync, specialists in floating structures in Netherlands, residents would live in flats of 70 sqm, with terraces open to the sea. Solar energy would power daily living, including electric-only cookers , while water for showers and drinking would be supplied by the rain. Early residents would include entrepreneurs , social experimenters and people to tend the floating fish farms. A helipad would allow access to land-based hospitals or for when self-sustainable living becomes painful. 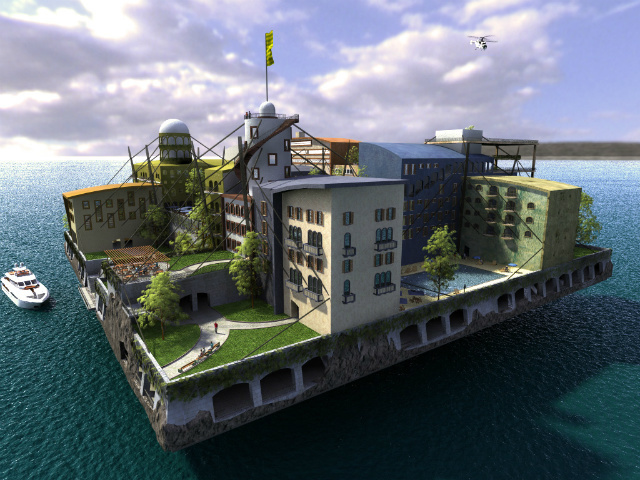 The vision is funded by a US non-profit organisation, the Seasteading Institute, established by two darlings of the libertarian movement including the billionaire founder of PayPal, Peter Thiel. Establishing an independent non-state settlement on the seas is not a new concept. Roy Bates, a retired army major, occupied a WWII sea fort off Suffolk in 1967 and a decade later he declared Sealand a sovereign principality. Britain does not recognize Sealand as an independent state, but the Bates family remains unmoved. The first rudimentary seastead project is slated for launch in 2014 by a group called Blueseed. It is essentially a ship moored far enough off the California coast to sidestep US immigration rules. For safety reasons, the first proper seastead is likely to be anchored in a protected bay inside the territorial limits of a "host" country. The institute claims to be in talks with up to five governments to be the first host. It aims to seal a deal in 2014, with the first seastead residents moving in by the end of the decade.